Today happens to be my 35th birthday. I am one of those people who absolutely adore their birthday! I am guilty of happily informing complete strangers, “It’s my birthday today!” while waiting in line or shopping. While it unnerves my husband, it always seems to make people smile and they almost always wish me a hearty “Happy Birthday!” greeting. Once, we went to Silver Dollar City on my birthday. I excitedly informed the ticket-taker that it was my birthday and she gave me a large ribbon to wear that had, “It’s my birthday!” printed on it. Everywhere we went, folks wished me a “Happy Birthday”. My husband Joey got the biggest kick out of watching me smile with delight every time I got a birthday greeting. Each year I find that my birthday is a little different. When Joey and I were in our teens and dating, he often used to save up his money and surprise me with a nice piece of jewelry and a bouquet of roses from the florist. When we were first married and our finances were flying high, we might stay in a nice hotel, eat at a fancy restaurant, and then shop at my favorite stores. After our daughter Elizabeth came along and we started the farm, everything in our lives changed dramatically, including birthdays. It was at that point in our life that we started realizing that simpler is almost always better. Our lives took a total shift that caused us to rethink everything that we had been doing. With our small budget, staying in a fancy hotel, expensive jewelry, and shopping sprees were no longer an option. I began to realize that birthdays would never be the same. When I say that birthdays would never be the same, I don’t mean this to be a bad thing. Birthdays changed in a dramatic, but wonderful way. For one thing, fancy restaurants were off the list. In place of this, we started cooking and decorating for a special birthday dinner at home. We decorate the dining room with homemade paper decorations and bring out our fanciest dishes. You know all those pretty antique dishes that belonged to your Grandma? Get those out and use them! They look lovely in the candlelight and she’d probably smile knowing that you were enjoying them. Besides the beautiful dishes and candlelight, another lovely thing to do when dining at home is to dress up. Go ahead, wear your Sunday best! Pin up your hair, put on your make-up, and have your husband put on his best dress shirt and pants. It may sound silly, but it really makes the occasion seem special. You can even snap a photo or two while you are all dressed up! A second birthday change had to do with the presents. Always before, we had bought each other expensive store-bought presents. With this no longer a good option, we began to look around for something else. The obvious choice was to make something. Over the years, I’ve made Joey a double batch of his favorite cookies, Elizabeth has embroidered him handkerchiefs, or we’ve given each other homemade coupons that can be redeemed for chores or fun family game nights at home. We still buy some presents (especially for our daughter Elizabeth! ), but the ones Joey and I buy for each other usually aren’t extravagant and often are antique. Birthday cards were another item that became homemade I have found that a homemade card with a little note inside is a wonderful keepsake. I often find myself setting them out or hanging them up as decorations. Now, let’s talk about flowers. Did you know that there are all kinds of flowers around? We have some beautiful flowers that rival any that I ever got from a florist. These flowers grow right in our yard. A single wild rose or even a bouquet of dandelions (I know…dandelions aren’t technically a “flower”, but I think they’re pretty…) tied with a pretty ribbon can be beautiful if they were picked for you by someone who loves you. Yes, birthdays certainly aren’t the same. They are much simpler, and in a wonderful way, much more special. Each present seems so special knowing that it’s been carefully made or chosen just for you. Today at market, some of our friends that work at the market brought me flowers from their garden, homemade fudge, and a beautiful antique jewelry set. All of these gifts were a total surprise to me and were very special because they were straight from their hearts. Other friends stopped by or drove by to wave and shout a birthday greeting. A family member unexpectedly treated us to lunch at one of my favorite restaurants. All of these things combined to turn a hot, sticky, market day into a special and fun time. When I got home, my sweet mother-in-law was waiting with a special card and present for me. 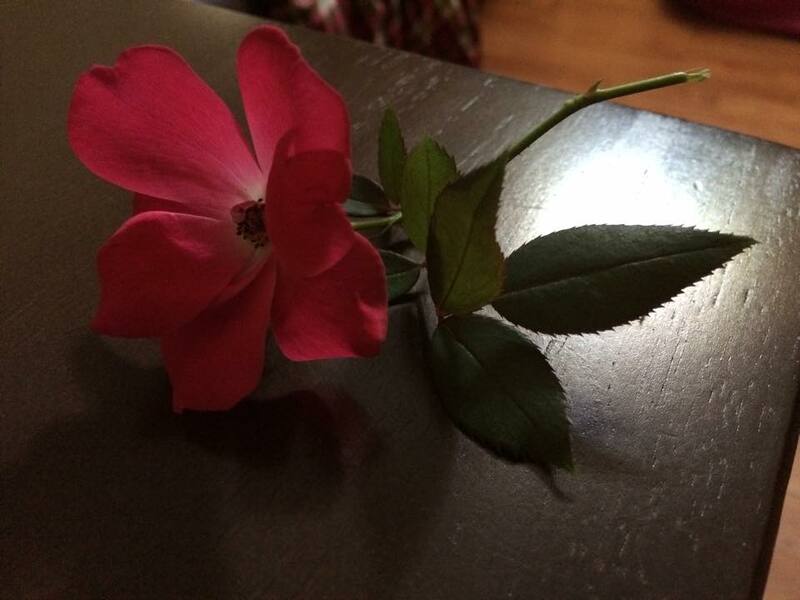 My daughter Elizabeth surprised me with a matching skirt and handkerchief that she had made herself, and a few moments ago, Joey brought in a beautiful rose that he picked for me. To top it off, tonight, my mother is cooking a special birthday dinner, complete with my favorite homemade chocolate cake for dessert. Life truly is sweet…especially on your birthday! Here is my beautiful birthday rose that Joey picked on our farm.